This dynamic set of books consolidates the powerful lessons about oscillations in one place! This series of lessons (also online) allows students to explore and see the deeper nature of what is causing particular behaviors. Help students discover the iceberg.... Purchase one or the whole setl! Oscillation lessons focused on beginning systems students. Explore springs, interpersonal relationships, and predator/prey interactions in these excellent lessons. 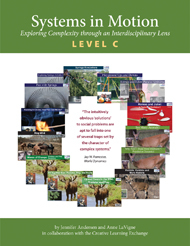 Expand upon the level of complexity explored during the Level A book! Also, begin to touch on the complex nature of burnout and commodities. Level C lessons are much more complex and include specific information to make these lessons easier to understand. In these lessons, students explore springs, interpersonal relationships, predator/prey interactions, burnout, and commodities. Or buy the bundle of one of each for $60.00 and save!! Systems in Motion: Level B A value is required.Invalid format. Systems in Motion: Level C A value is required.Invalid format. Combo Pack (one copy of each book) A value is required.Invalid format. A value is required. To learn more the Complex Systems Project or Oscillations lessons, please be sure to visit the other pages at the Creative Learning Exchange. Online simulations are also available at the CLE!